This photo is a new favourite, so new in fact that it was only taken a few days ago. When: During the annual Brisbane Open House on 7th October 2017 (told ya it was brand new). 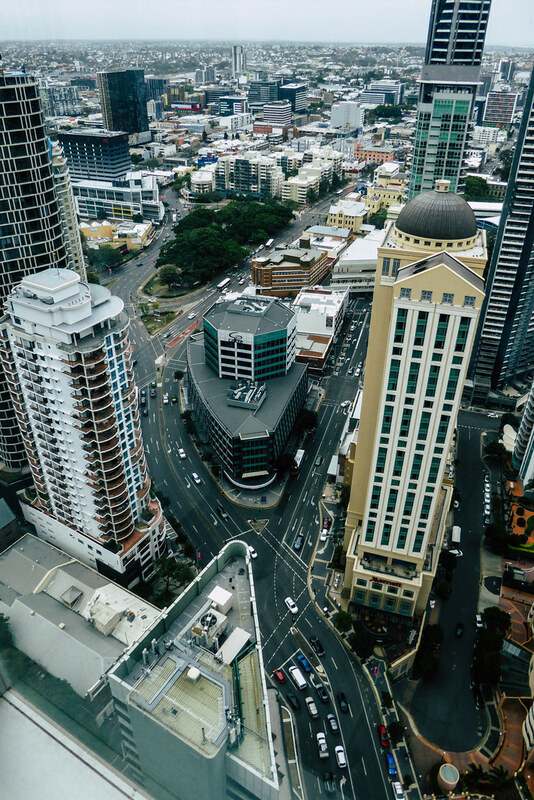 Interesting Fact: Well interesting to me anyway.. when I moved to Brisbane about 15 years ago, the Marriott Hotel (the one with the dome), was one of the tallest buildings in this area. It is now dwarfed by the surrounding buildings. But it remains one of my favourite Brisbane buildings because of the Art Deco vibe it has going on. 480 Queen Street: This 32 floor building was finished in 2016 and is located down the Story Bridge end of Queen Street – one of the main streets of Brisbane. You can also access the building from the adjacent Adelaide Street, where they have escalators going up to a public space that house a restaurant, bar and view of the Story Bridge and Brisbane River. The escalators travel past large panels depicting a nature story – the are pretty amazing and are topped off with a mirror ceiling, giving you an optical illusion kind of feeling. Editing: I edited pretty much all of my photos in some way, shape or form. Some I edit more than others but this photo I used a preset edit that I had downloaded into the Lightroom program that I use and really loved it so didn’t really do too much more to it. I think the preset used really enhances the buildings and street below and makes it look a bit more dramatic than the original did. Mind Blown: During the tour I did, we were taken to the 32nd floor, where this photo was taken. On this floor there is a communal area that had a couple of ping-pong tables set up along with various types of seating (there were even a couple of bean bags). 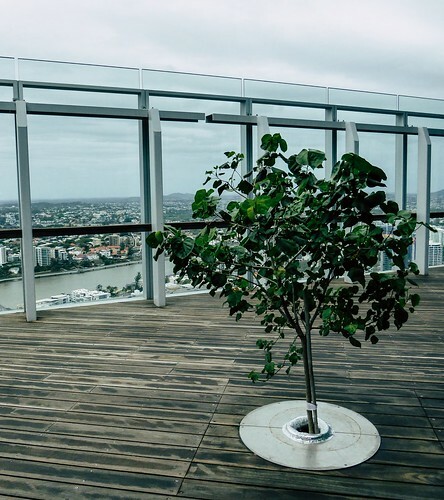 There were floor to ceiling windows giving an amazing panorama view of Brisbane city but the icing on the cake form was the outdoor area where they had a deck, more chairs and another amazing view – I took the above photo from this outdoor area. But the thing that blew my mind was the fact that they had trees.. in the deck.. on the 32nd floor! I have to actually put a photo here of one of the trees because it really was amazing! Final Thoughts: I love this weeks photo because it just looks cool. I kind of feel like it is the kind of photo that someone else would take and I would admire – does that sound egotistical? I love the colours of the photo, the depth of field and obviously the architectural element. It reminds me of how far this city has come in the time that I have lived here. I might have a bit of a love/hate relationship with Brisbane, but at the end of the day, there are some pretty amazing views to be had in this city. Previous Why Can’t I Decide?